Orange County is among the rural areas in southeast Texas swamped by floodwaters from Tropical Storm Harvey. 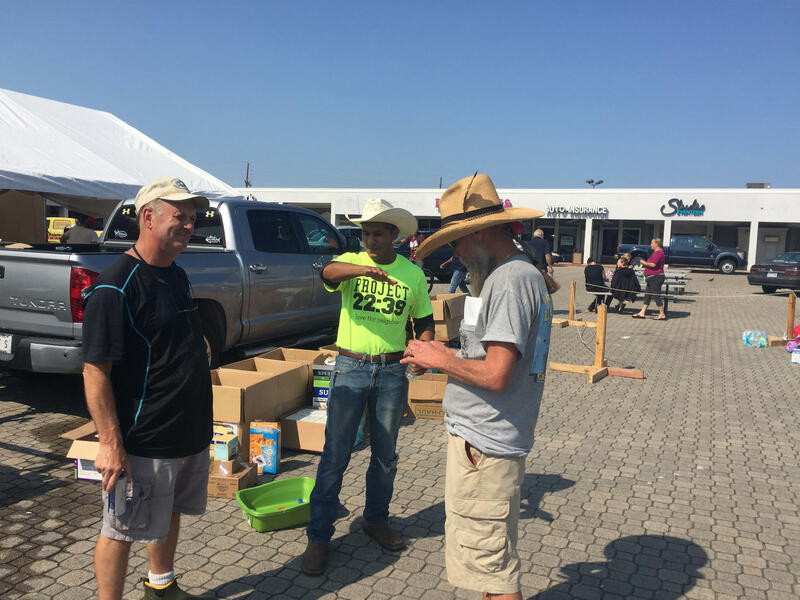 Epi Mungui (center) has been working in a strip center parking lot in his hometown of Orange, Texas, to get donations of food, water and clothing to flood victims. 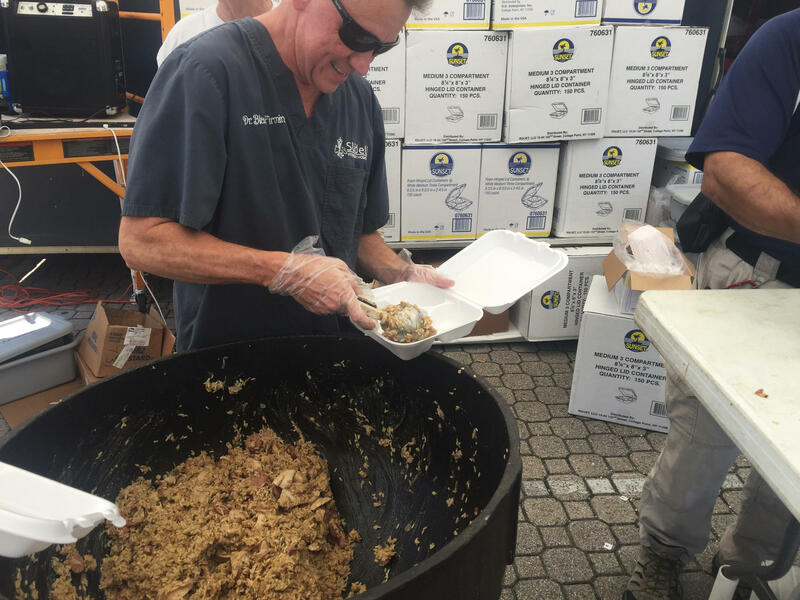 Volunteers from Catholic men's clubs in Slidell, La., have been serving up three hot meals a day. 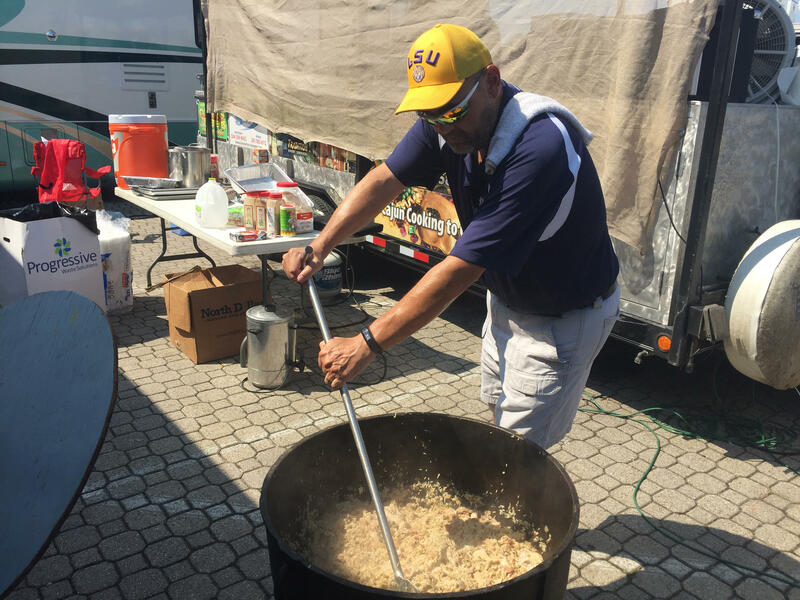 Volunteer Mike Hall stirs a batch of jambalaya in a gas-fired kettle. Volunteer Randy Melerine (L) of Slidell serves cake and fruit to people waiting for lunch. He remembers what it was like to be flooded. "I never even had a shirt after Katrina," he says. 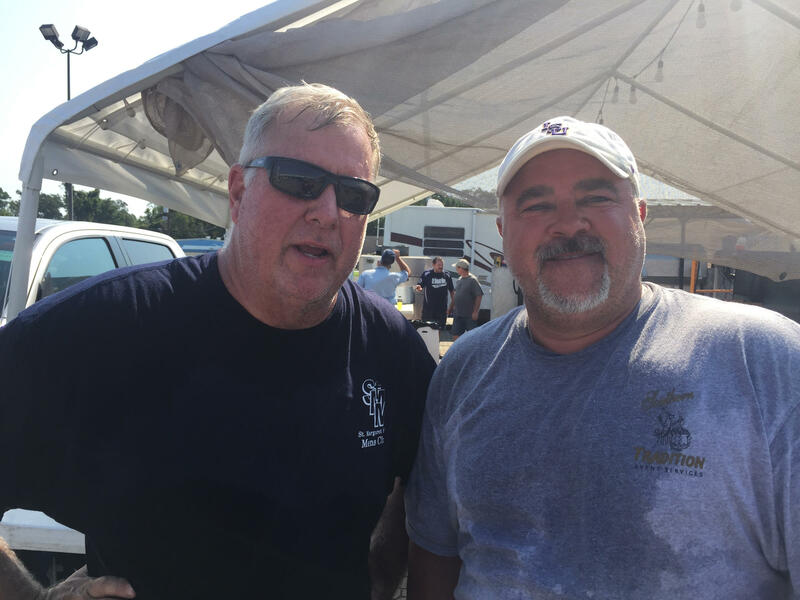 Bill Borchert (L) and Troy Hueschen are helping coordinate a makeshift kitchen to cook for victims and responders. "We been through it with Katrina so we here to serve the people," Hueschen says. People line up for a hot lunch of jambalaya and pulled pork in the Market Basket parking lot which has become a response hub for storm victims in Orange, Texas. "We got water. People have been bringing canned food," he says, pointing to boxes where the goods have been sorted. "We've got diapers. They keep coming in, they keep going. We've got baby food, formula," Mungui says. This parking lot is where the National Guard and volunteer rescuers first brought people displaced by floodwaters — a sort of hub for evacuations. Mungui says word spread, and donations started pouring in. "It's heartbreaking, but you know what, it's amazing to see people come together in a time of distress," he says. "I wish we could be like this all the time." Orange is near the Louisiana line, and the so-called Cajun navy has been in full force here. People like Van Lorena. "We rescued this neighborhood Wednesday morning," he says. Then they came back with basic necessities. "We brought everything from tampons to batteries to diapers — you name it," Lorena says. He's from Denham Springs, La., which was devastated by a flood last year. He says it was an easy call to come help Texans in the same fix. "You couldn't not," Lorena says. "I'm not the kind of guy who could just sit there and watch it on the news and not do nothing." More Louisiana folk are in the kitchen — really just a trailer and a tent stocked with a grill, a smoker and a giant gas-fired kettle. To get ready for lunch, they're using a big metal paddle to stir onions, bell peppers and seasonings for a jambalaya. The smell wafts through the humid air, and people are lined up by midmorning. 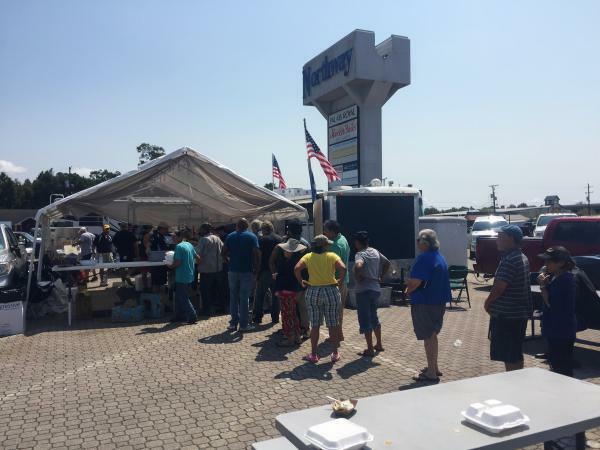 Randy Melerine says they'll fly a blue Louisiana flag atop the tent to signal when the noon meal is ready — the jambalaya and pulled pork sandwiches. In the meantime, he hands out cake and fruit. "You want some cake, baby?" he asks 70-year-old Rita Deal, who takes a slice. "Got water in my house," she says. "I'm hungry. [I] live alone." She's a cancer patient, and has been staying in her soaked home with no electricity ever since the water woke her early Wednesday. "I heard something go blub, blub, blub," she describes. "I live at the end of the sewer line and it was coming up through both commodes." She's weary at the thought of mucking out. "I went through Hurricane Rita and lost everything and here I go again," Deal says. "I'm too old to start again." After lunch, she sorts through boxes — getting a toy for her dog, some bottled water and packs of crackers to take back home. More supplies are coming, says Gary Hill, who manages the Market Basket grocery store next door. He's become the unofficial commander of this operation. "This parking lot has been a control center," he says. "All we've been doing is coordinating with the fire department, the police department, the Cajun navy, the best we can. And everybody who is coming to our parking lot." Hill's been sleeping on a bean bag chair at the store. A tear rolls down his cheek as he talks about all the officials and volunteers who have come to help in Orange. "They're taking care of us, really wonderful people," he says. "It's about working together as a team. Cause you know what? We're all the same in the eyes of God," Hill says. Neighbors, including the hairdresser who owns the salon next door, have come to stock empty shelves so the Market Basket can open to the public once power is restored. In the meantime, the grocery store has been cooking what food it has for the local police and sheriff's departments, working on a backup generator. Outside, Troy Hueschen is overseeing the makeshift kitchen, which has served thousands of hot meals in Orange. Breakfast, lunch and dinner. He owns Southern Traditions, a cooking trailer that can be hired out for tailgate parties. Now he's working with two Catholic men's clubs from Slidell, La., just outside New Orleans. "We been through it with Katrina, so we here to serve the people. And so we all need to stick together," Hueschen says. "That's what Americans do." Flood victim Charles Sam is having lunch. "I appreciate it," he says. "I appreciate it to the fullest. You don't find this too much many days. You know most the time everybody's out for themselves." He's stuffed a black plastic garbage bag with his medications and a few personal belongings, and is waiting here in the parking lot to be evacuated to an emergency shelter in Alexandria, La. "This is my first time evacuating," Sam says. "But I can't stay." Because like communities all across southeast Texas, his neighborhood is uninhabitable. Now to Houston and the devastation that city is facing due to Hurricane Harvey. Volunteers have come from all over to help - neighbors and strangers working together. NPR's Debbie Elliott takes us now to meet some of the people who have loaded up their boats for rescues and packed trailers full of food and water to aid people who no longer have a home. 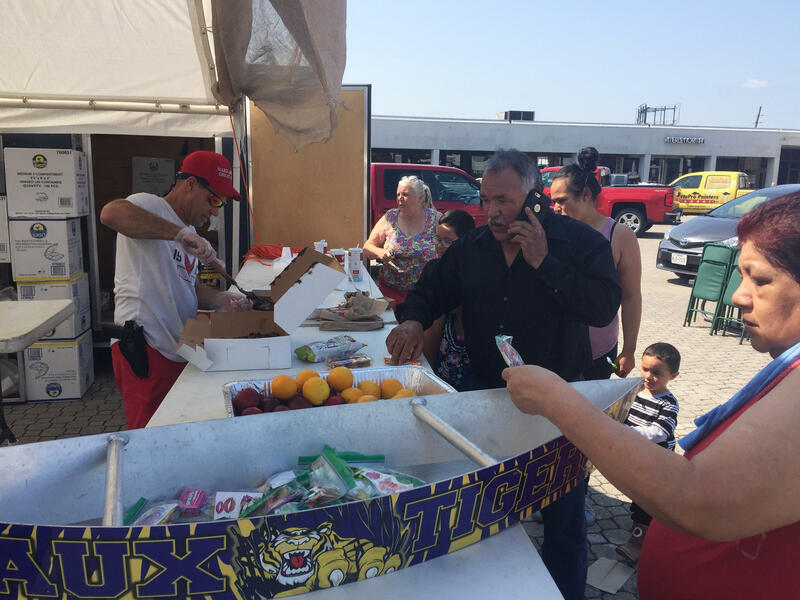 DEBBIE ELLIOTT, BYLINE: Epi Mungui is overseeing a makeshift distribution center in the middle of a sweltering-hot strip center parking lot in his hometown of Orange, Texas. EPI MUNGUI: We've got water. People have been bringing canned food. We've got diapers. They keep coming in. they keep going. Baby food - we've got formula. ELLIOTT: This parking lot is where the National Guard and volunteer rescuers first brought people displaced by floodwaters, a sort of hub for evacuations Mungui says word spread, and donations started pouring in. MUNGUI: It's heartbreaking. But you know what? It's also amazing to see people come together in a time of distress. I wish we could be like this all the time. ELLIOTT: Orange is near the Louisiana line. And the so-called Cajun Navy has been in full force here, people like Van Lorena. 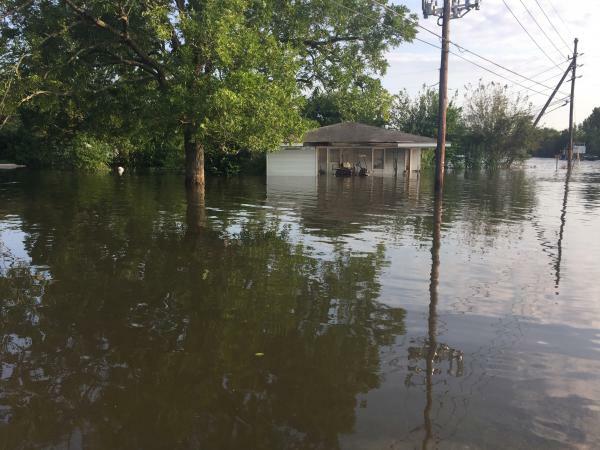 VAN LORENA: We rescued this neighborhood Wednesday morning. And then after they got all that done, we said, we'll just come back and bring them. So we brought everything from tampons (laughter) to batteries to diapers. You name it. ELLIOTT: He's from Denham Springs, La., which was devastated by a flood last year. He says it was an easy call to come help Texans in the same fix. LORENA: Well, you couldn't not. I'm not the kind of guy that can sit there and watch it on the news and not do nothing. ELLIOTT: More Louisiana folk are in the kitchen - really, just a trailer and a tent stocked with a grill, a smoker and a giant gas-fired kettle. RANDY MELERINE: (Singing) Jambalaya, crawfish pie, file gumbo - hey. ELLIOTT: People are lined up by mid-morning. UNIDENTIFIED MAN: What are we eating today, brother? MELERINE: Twelve o'clock, we're going to have some jambalaya and pulled pork sandwiches. ELLIOTT: Randy Melerine hands out cake and fruit until the noon meal is ready. MELERINE: You want some cake, baby? ELLIOTT: Rita Deal eats a slice. RITA DEAL: Got water in my house. So I'm hungry (laughter). I live alone. ELLIOTT: She's a 70-year-old cancer patient and has been staying in her soaked home with no electricity ever since the water woke her early Wednesday. DEAL: I heard something go blub, blub, blub, blub at the end of the sewer line. And it was coming up through both commodes. ELLIOTT: She's weary of the thought of mucking out. DEAL: I went through Hurricane Rita and lost everything. Here I go again. I'm too old to start again. ELLIOTT: After lunch, she sorts through boxes, getting a toy for her dogs, some bottled water and packs of crackers to take back home. More supplies are coming, says Gary Hill, the manager of the Market Basket grocery store next door. He's become the unofficial commander of this operation. GARY HILL: This parking lot has been a control center. ELLIOTT: Hill's been sleeping on a beanbag chair at the store. A tear rolls down his cheek as he talks about all the officials and volunteers who have come to help in Orange. HILL: They're taking care of us. Really wonderful people. It's about working together as a team 'cause you know what? We're all the same in the eyes of God. ELLIOTT: Outside, Troy Hueschen is overseeing the makeshift kitchen staffed by two Catholic men's clubs from Slidell, La., just outside New Orleans. TROY HUESCHEN: We've been through it with Katrina. So we're here to serve the people, and we all need to stick together. That's what Americans do. That's what we do. ELLIOTT: Charles Sam is having lunch. CHARLES SAM: I appreciate it. I appreciate it to the fullest. I mean, you know, you don't find this too many days. You know, most of the time, everybody's is out for themselves. ELLIOTT: Sam's house flooded, so he stuffed a black, plastic garbage bag with his meds and a few personal belongings and is waiting here in the parking lot to be evacuated to an emergency shelter in Alexandria, La., because, like communities all across southeast Texas, his neighborhood is uninhabitable. Debbie Elliott, NPR News, Orange, Texas. Transcript provided by NPR, Copyright NPR.